Plantation Shutters Oxford from your local experts, Just Shutters. Covering Oxford, Headington, Summertown, Kidlington and surrounding areas. 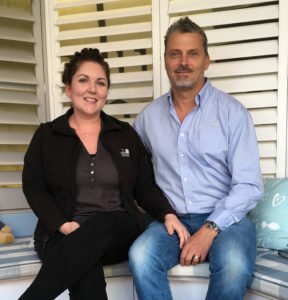 Our local Oxfordshire shutter experts, husband and wife team; Charlotte and James Chenery (pictured right) bring you the personal care and service that comes with being local, with the high quality, value and lifetime guarantee of the Just Shutters brand. Call us on 01235 424282 for further information. The pair have a passion for beautiful design, and the local area in equal measure. With its historic quintessentially British heritage, unique charm and rich tapestry of architecture from across the ages, Oxford is the perfect city in which to live and work. With properties to match the richness and vibrancy of Oxford’s history, we are the skilled experts you can trust with your home. 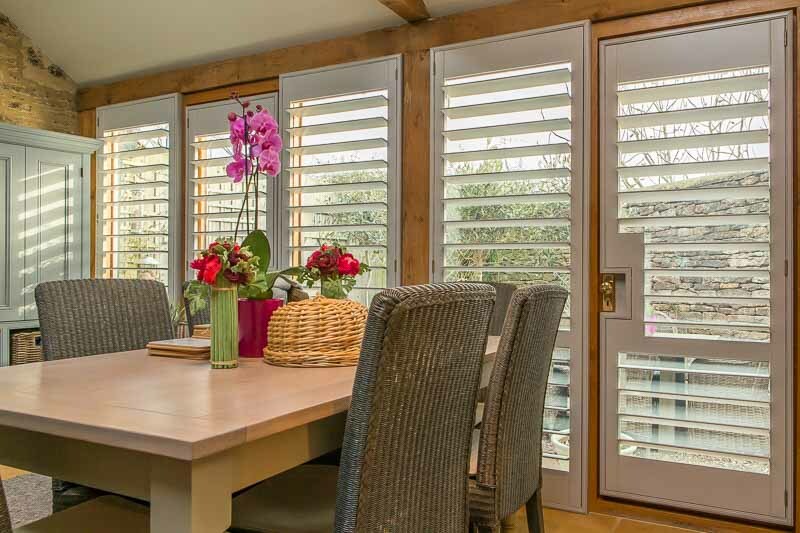 What’s more, we have the widest range of glorious internal shutters to match any architectural and personal style. Just Shutters have designed and installed over 8000 customers homes and businesses; both modern and traditional. So whether you have a beautiful bay window, an unusual shaped atrium, a perfect round porthole or a large conservatory, we have the experience and passion to get it Just right. With our skills, coupled with the largest range in the UK, we can guarantee to match your home, style and expectations. Often seen as a luxury product, shutters can appear to be expensive. This is mainly due to them being seen in high-end design magazines, interior designer showrooms and boutique hotels. However, shutters actually provide excellent long-term value. Their popularity is growing across all styles and ages of homes. Homeowners are finding that not only are they very reasonably priced for the quality of product, but their value is long lasting. It can be a misconception that curtains or blinds offer a ‘value’ option. Conversely, shutters are similar in price to bespoke curtains or blinds; furthermore, after years of wear and tear nothing stands the test of time like beautiful plantation shutters. Therefore offering long lasting value. What is more, our lifetime guarantee means that year after year you can be confident in the quality of your shutters. Long after fabrics would bleach, or blinds could warp, shutters will be providing you with value and peace of mind. No, on the contrary, our customers feed back to us their delight in being able to maintain the feature, light, view and use of their windows or doors; while being private and secure. Unlike net curtains that shield the view, shutters enhance it. Please take a look at our shutter galleries these will give you an idea of the way our stunning shutters enhance a window. DO YOU HAVE A RANGE OF OPTIONS? Yes, we offer the widest range of style and finishing options in the UK. what is more, we now offer exclusive ranges you simply will not find elsewhere. We have a Just Shutters signature style that customers just love! In terms of style, the possibilities are endless; not only do we have a range of materials, we have many louvre size options, and can even colour match to make sure our shutters suit you and your home perfectly. Quite simply we have an outstanding reputation and product range. We would be delighted to show you exactly how we have earned this over the years. You can request a brochure for further inspiration, arrange a free design consultation in the comfort of your own home, or call us on: 01235 424282. While we can always sing our own praises about our plantation Shutters Oxford, here are the more important voices of our customers. With over 1800 national reviews on Checkatrade scoring us 9.9/10 we would love to welcome you among our happy customers! Shutter installation – bay + standard windows. Installation of shutters for the whole of our new property. Fabulous! 1st class. Shutters fitted to conservatory plus 2 bedroom windows. Measuring, making and fitting shutters.